I walked into my tour of the Uffizi Gallery knowing little to nothing about art or its history. But the beauty of the art, the stories of the artists, and the significance of these pieces to Italy were truly inspiring. Seeing art displays always reminds me of my artist friends. It is amazing to me how they can create a landscape or a body on a flat white page. Even though this sense of third dimension is now so standard in art, it was a huge development in earlier centuries. 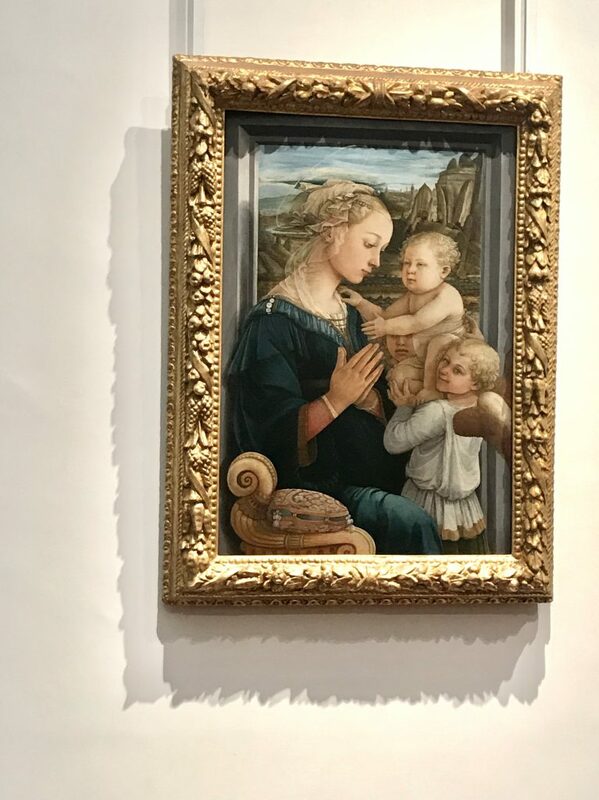 Before, during, and after the renaissance, artists were taking steps towards bring their paintings off the page (or wood, which was the more typical medium for Florentine art). 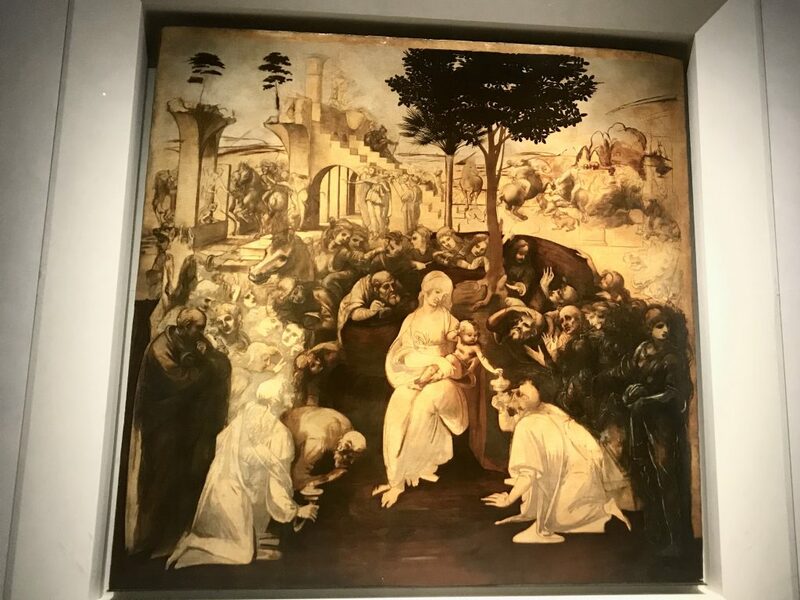 Notably, the best way to see this transition in the Uffizi Gallery is in the room of the Maestà. There are several of these representations of the Virgin Mary. She is on a throne, holding the infant Jesus, surrounded by angels. Throughout the room, you can see how the earlier depictions are fairly flat, almost completely lacking any sense of the third dimension. Then years later, some depth is added to the portraits. 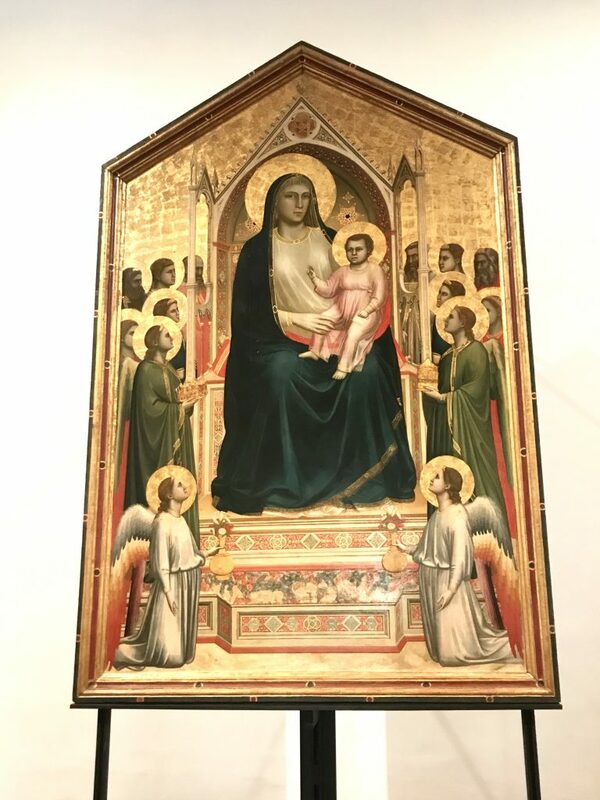 Finally, there is the Maestà of Giotto. In this painting, you can see round faces, layers of the angels, and texture in the clothing. Another artist who expanded on this concept of depth was Filippo Lippi. One of his most famous paintings is of the Virgin Mary. It was a popular theme, at the time, to depict the Madonna with the infant Jesus and with angels. Nevertheless, this painting stood out among the rest for a few reasons. The lack of a full throne, the positioning of the characters, and the depth of the landscape in the background were not typical of the time. But to me, the loveliest thing about this painting is the rosiness of the Madonna’s cheeks. This is not only beautiful, but was an incredibly rare and difficult to paint at the time. This is because the type of paint used at the time dried very quickly, and had a distinct coloring. The shading of this painting was a huge development by Lippi. One of the best parts of having a tour guide was her extensive knowledge of the stories behind the art and the artists. Apparently, there are a couple of potential interpretations behind what is now my favorite painting. Admittedly, I loved La Primavera for its vibrant colors and floral patterns. But it holds messages of love, peace, and prosperity. Some have found it to symbolize stories in mythology, since it features famous gods and goddesses. But others have found stories of Italy’s history in the painting. What do you think? Additionally, I loved seeing the development of the great Leonardo Da Vinci. 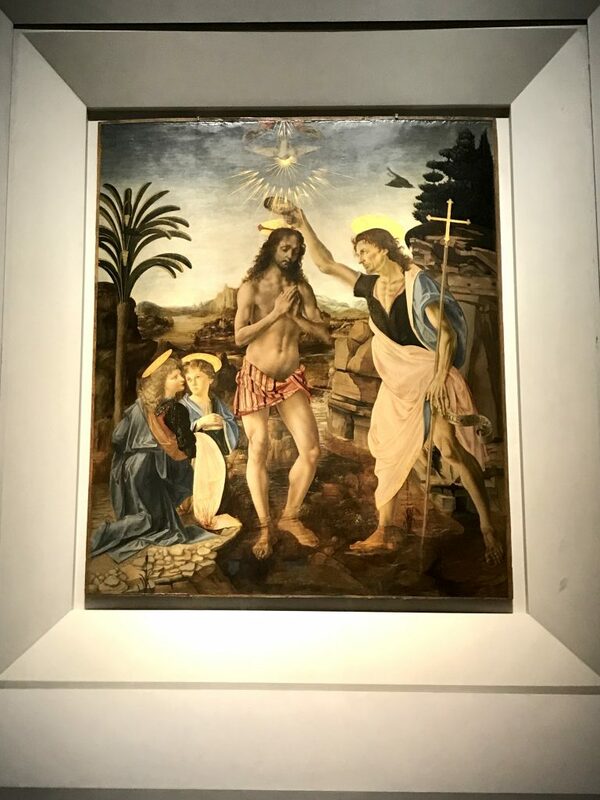 While working on The Baptism of Christ, he was still a student, and only helping Verrocchio. He painted the young angel on the left, and likely also the figure of Christ. In this painting, you can see a contrast between Leonardo’s technique and that of the others. According to Leonardo, there should not be black outlines in paintings, because there were no such outlines in reality. He developed a technique of smudging these outlines to give a more realistic appearance to the people. 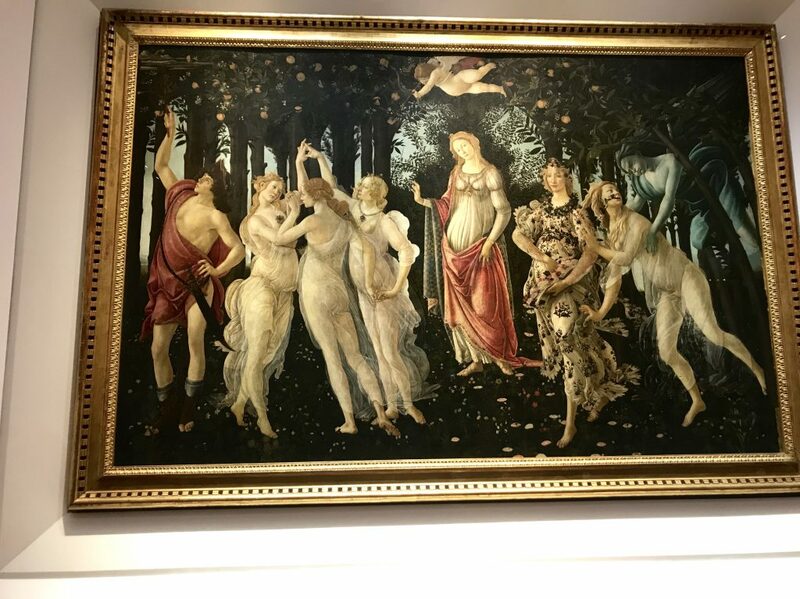 Something that is now expected of artwork started with Leonardo, and can be seen in this photo at the Uffizi Gallery. Moreover, I was particularly struck by the unfinished painting of Leonardo. This work is full of light sketches, in which you can see the process of how Leonardo worked. In this piece, you can see that some parts are more complete than others. This gives the piece a skeleton to built around. In some spaces, however, there are traces of charcoal outlines. If you look at the horses on the right hand side, it looks like he was figuring out what he wanted the horse to look like. It’s all the same animal – just different drafts on the same page. There’s a family you need to know when going to Florence – the Medicis. This family was in power in Florence for a very, very long time. A lot of the art, buildings, and developments throughout Florentine history were funded by this family. Therefore, they belonged to them. Later, when the last of the Medici men had died off, there was one daughter left. Because she was female, Maria Louisa Medici could not inherit the power or possessions of her family. 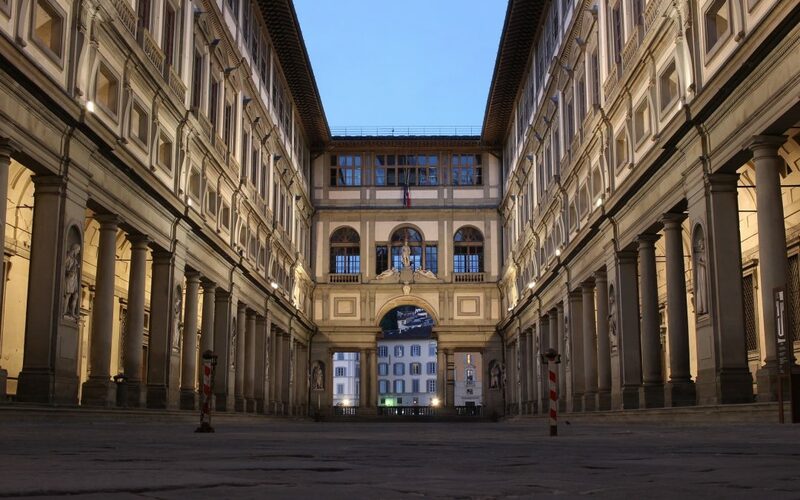 However, she made a contract with the upcoming family in power to ensure that all of the art was left to the people of Florence, and others who would come to see it. Many cities have been full of art, culture, and history. But many cities have lost those things. One of the most incredible things about Florence is that it has maintained that art, that history, and a great sense of pride for it. It is all thanks to Maria Louisa Medici that we have the paintings of the Uffizi Gallery. When I left my tour, I felt like I was stepping into a completely different Florence. I had been living there for a month, but never realized how drenched the city was in historical significance. For instance, I learned from my tour guide that every day I was walking on the only bridge the Nazis hadn’t bombed – and I didn’t even know. This preservation of history is something that has come to define Florence. 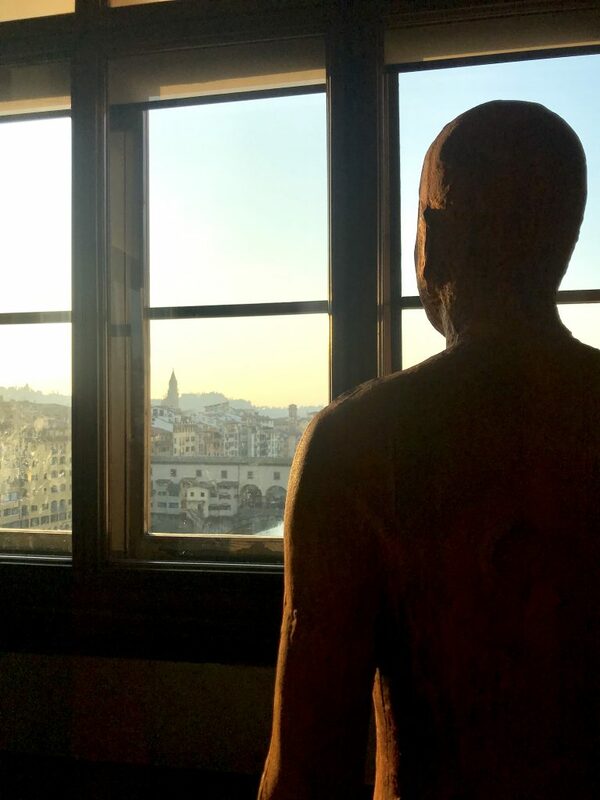 When people think of this city, they think of art history. They think of Leonardo and Michelangelo, and of the science of Galileo and the poems of Dante. By the end of my tour of the Uffizi Gallery, I cared more about art, about Italy, and about the history here.